Handmade from bark from the Lokta bush, this Origami Lokta Paper is dyed with a natural vegetable dye in Himalayan tones. Each sheet is hand-crinkled to create a two-toned mountainous terrain pattern in pink, blue and purple colors. The Himalaya Lokta Origami Paper takes its inspiration from the jagged peaks of the Himalaya Mountains and features color tones from Nepal. Each sheet provides the look of a topographical map of mountains. 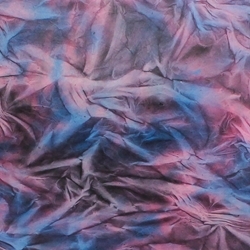 The pink, blue and violet colors blend and bleed together adding shading and amazing visual interest. While looking 3-D, these papers are actually quite smooth. To make these beautiful papers, a strong base sheet of Lokta paper weighing 60 GSM is crinkled by hand providing texture and lines. Vegetable dyes are then applied by hand to the paper complimenting the texture of the sheet. The papers are then pressed smooth. Himalaya Lokta Papers are acid-free and available in multiple sizes. The 19" x 29" size includes deckled edges on all 4 sides. Hand-made from start to finish, every sheet is completely unique and a piece of art of its own. Use the Himalaya Lokta Paper in any fine art project needing a touch of texture and subtle color. Available in 2 Sizes: 6" x 6" and 9" x 9".